Does a Quinolone help Prevent BK Virus Nephropathy in post Kidney Transplantation? The 22nd NephJC chat occurred on March 3/4. It was a very interesting and educational chat. NephJC returns to kidney transplantation - with an RCT from JAMA to boot! BK Virus is a polyoma virus which has a prevalence rate of 60 – 80% in the general population with peak seroprevalence seen by 3-5 years. Clinical disease in the non-transplant population is rare. It is post kidney transplantation that BK virus assumes importance - especially since the introduction of modern immunosuppression. In some of these patients, BK virus activation leads to increased risk of allograft loss from a viral interstitial nephritis. In their NEJM paper Hirsch et al demonstrated the probability of development of virus replication in urine, viremia and nephropathy. There is no proven therapy for BK virus nephropathy and most centers would recommend regular screening with reduction of immunosuppression to combat viremia. 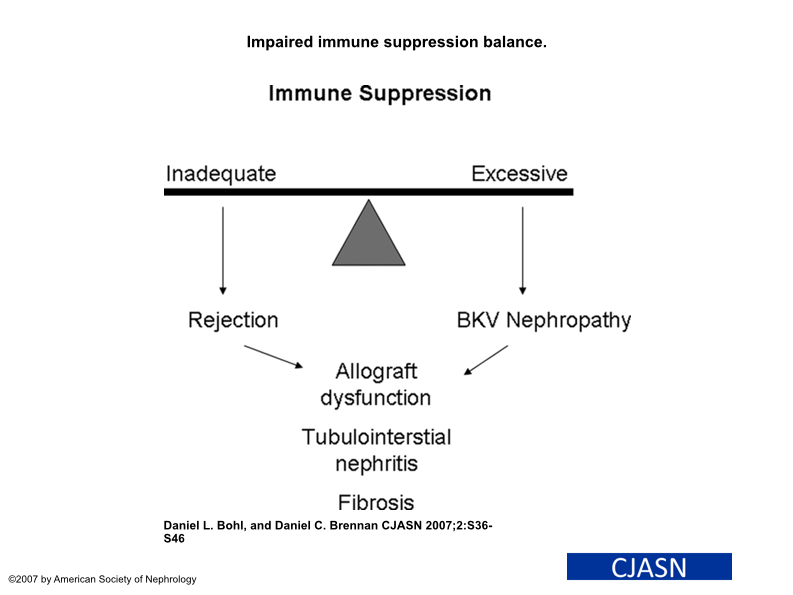 As shown in the cartoon from Bohl and Brennan in CJASN below, there is a thin line between over and under immunosuppression, often compounded by the inability to confidently define “net state of immunosuppression”. The most difficult scenario remains when BK viremia occurs with or soon after rejection as the treatment for each of these entities continues to be diametrically opposite. Polyoma viruses, including BKV and JCV, are small, non-enveloped double stranded DNA viruses. The genome encodes for the early regulatory proteins—small t antigen and large T antigen—and the late structural proteins—VP1, VP2, and VP3 these help regulate the virus replication and disrupt host cell processes. Retrospective analysis has shown that quinolone antibiotics, by their anti-DNA activity, are associated with lower rates of BK viruria, viremia and nephropathy. Group 1 were patients on co-trimoxazole prophylaxis and Group 2 were patients on quinolone antibiotic prophylaxis for 1 month post-transplant. Until now, there were no prospective RCT data for the use of quinolone in preventing or reducing the incidence of BK viruria in kidney transplant. This current NephJC will discuss an RCT of Levofloxacin as prophylaxis for BK Virus post renal transplant. Hypothesis – Levofloxacin in sufficient dosage early after kidney transplant could significantly reduce BK viruria. Defined as 500 copies/L of BK DNA in urine. Incidence and types of all adverse events – including – rejection, C difficile and other infections, quinolone resistant infections, allograft failure and mortality. Estimated on literature suggesting 35% BK viruria in placebo group in 1 year post TX. Clinically relevant absolute reduction of BK viruria of 20 % (i.e. 35% to 15%). (Consensus based on survey of experts from Canadian Renal TX Study Group). 612 consecutive renal transplants in participating centers were evaluated for eligibility. Ultimately 154 patients were randomized – 76 to Levofloxacin and 78 to placebo. Planned follow up was to be for 12 months but due to resource constraints the trial was terminated early and 38 patients had not completed the 12 month follow-up. 11 of the 38 developed viruria, leaving 27 at risk of the primary outcome. Overall mean follow up was 46.5 weeks in levofloxacin and 46.3 weeks in placebo groups. Equal number of patients in both groups discontinued for various reasons. No Difference between BK viruria in Levofloxacin group (29%) vs placebo (33.3%) with RR 0.87 (CI 0.54 – 1.39) translating to absolute risk reduction of only 4%! Cox proportional hazards model adjusting for several factors demonstrated similar results. Clinical Events – no difference in BK viremia incidence (7.9% Levo vs 11.5% placebo) or blood and urine viral loads. Rejection was <10% and 1 allograft failed with no BKV Nephropathy. Similar in both groups – 59.2% Levo, 44.9% placebo. Non-significant increase in suspected tendinitis. Renal function and other adverse events were similar in both groups. In this multicenter, placebo-controlled randomized trial, a 3-month course of levofloxacin prophylaxis did not prevent the occurrence of BK viruria within the first year after transplantation. Levofloxacin prophylaxis is not useful at preventing UTI any better than placebo in Kidney transplantation. First RCT for any pharmacological intervention for prevention of BK virus in kidney TX. Robust design with well-matched groups with good generalizability and applicability. Central lab for all BK studies. Early termination – possibly did not affect the analysis much. It was a well conducted trial which seems to put to rest the quinolones in the management of BK Virus in Renal Transplantation as not useful and with increased risk of resistant. This paves the way for further work of pharmacological agents to 'prevent' BK viruria. Some information that would shed more light would be the immunological risk of the patients, immunosuppressive medication mean levels and doses and changes in the patients in the two groups in addition as that continues to be the chief driver for BK viruria. This summary was written by NSMC intern, the nephrologist who carries a screwdriver in his toolbox, Nikhil Shah, along with Paul Phelan.